The policewoman shot dead in Bradford on Friday was killed on her daughter's fourth birthday. Sharon Beshenivsky, 38, a mother of three children and two stepchildren, had been a serving constable for only nine months. 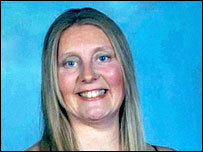 Her colleague injured in the shooting was Teresa Milburn, 37, who joined the West Yorkshire force in April 2004. Six people have been arrested in London in connection with the shootings outside a travel agents. Eyewitnesses said an Asian man and two black men armed with guns fired shots as they escaped with cash from the premises in Morley Street shortly after 1525 GMT. Pc Beshenivsky was an "enthusiastic, mature and very positive colleague" with an infectious laugh, said Chief Constable Colin Cramphorn. "I think her inspector said it all for me when he said he would have liked 30 Sharons on the shift," he said. Pc Beshenivsky had been a police community support officer for two years before joining the West Yorkshire force. She died after being shot in the chest, the chief constable said. He confirmed Pc Beshenivsky had been wearing body armour which provided limited ballistic protection, but the shot had penetrated her chest. Mr Cramphorn said her husband Paul and family were "completely devastated by the loss". The family lived in a converted barn in Keighley, West Yorkshire. Former neighbour Shahid Ahmed, 38, said: "They seemed like a very happy family. There was always lots of laughter coming from over the fence." Pc Teresa Milburn is married with a 16-year-old son. She was shot in the shoulder and remained under armed police guard in hospital. She had previously been a machinist and was hoping for a "complete change" and "new opportunities" in joining the force, Mr Cramphorn said. Giving details of the raid, Det Supt Andy Brennan said three men had inquired about buying tickets at the Universal Express travel agents in Morley Street, the same road where another armed robbery took place at a shop three weeks ago. The three men jumped over the counter and one member of staff was struck with a firearm across the head. An unknown quantity of cash was stolen. A witness saw the men going on to Edmund Street before getting into a silver vehicle. Mr Brennan said: "It is crucial that anyone with any information no matter how slight contacts the police." Officers were examining CCTV footage from the street where the shooting took place. Tom McGhie, chairman of the West Yorkshire Police Federation, said there was a sense of "disbelief and shock" among officers in the force. He said: "I can't imagine worse circumstances. It has a profound effect upon everybody and it touches a large number of people, not just police officers." The Bishop of Bradford, David James, said: I'm sure the whole city will be in deep sympathy with the families and with police colleagues over what has happened."